How much can you actually see with only one day in Amsterdam? Here's the Amsterdam 1-day itinerary we created for our first visit. We used it to see the best of Amsterdam, Netherlands' capital, from museums to canals to restaurants. They say every good thing has to end, and that includes river cruises. When our Rhine River cruise ended in Amsterdam one Saturday morning, many of our shipmates headed straight to the airport. That mystified us. After all, we had just arrived in a world-class city with bunches of things to see. Why miss the opportunity? Even though our travel plans only allowed enough time to be in Amsterdam for a day, it was better than nothing, right? 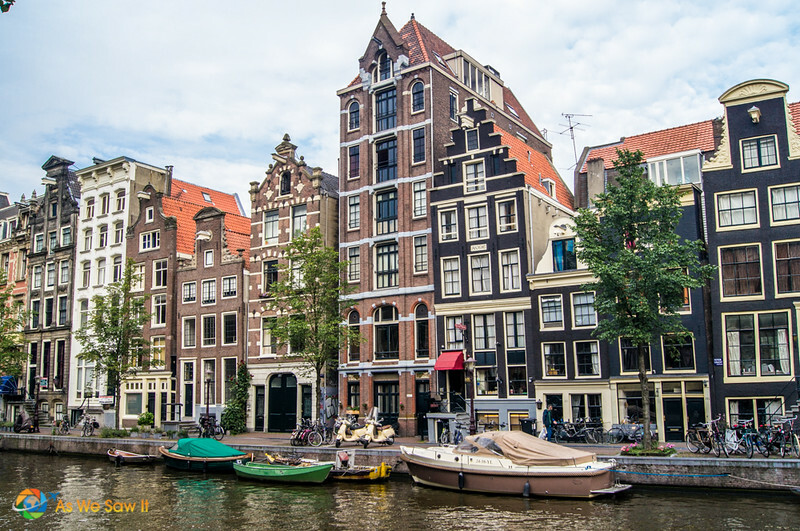 Except … How can anyone actually appreciate a world-class city like Amsterdam in one day? We had seriously pondered this “day trip to Amsterdam” dilemma for months. How much of the Netherlands' capital can a person see with a one day itinerary? How sad would it be to spend our 24 hours in Amsterdam sightseeing, only to discover afterward that we had missed visiting a mega-famous site? Well, I finally figured out which of the city's highlights to see, thanks in no small part to our Dutch friend, Farieda's thoughtful advice. Here's what Dan and I saw in our single day visit and how we managed to squeeze it all in. Tip: To help with your own planning, we've included links to tickets, tours, etc. for your convenience. If you find them useful, please book through our page. The price is the same, but some of the companies will pay us a small referral fee. Thanks for your kindness! First, here's our #1 tip: Protect your back and feet; be sure to wear good shoes! We had considered renting bicycles to get around, but Farieda had advised against it because we didn’t know the city very well. It's very unsafe to read a map while you're cycling through city traffic. Amsterdam offers an affordable public transportation ticket. That’s what we bought. You can purchase tickets both on the tram and at many hotels. Or buy them here before you go to save time and hassle. 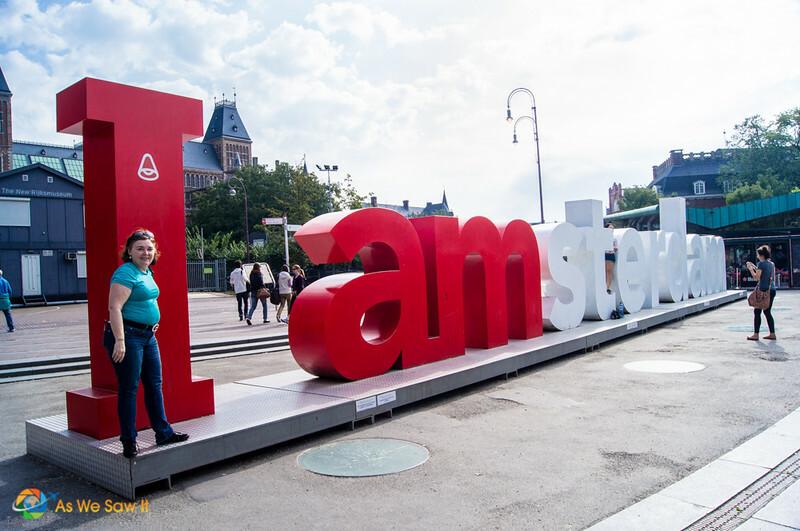 For more convenience, the IAMsterdam City Card offers unlimited use of the transport system plus free admission to many Amsterdam attractions. This 24-hour pass gives you access to the city’s public transport network along with a full day’s access to the hop-on and hop-off canal bus. You can download a transportation app which will help you find your way around Amsterdam by tram, bus, metro, ferry and even train. We found the tram system to be convenient and fun, not to mention a welcome break when our feet got tired. Tip: Before you set out, make a note of the tram numbers that stop closest to your hotel! Our final morning on board started with the usual huge buffet spread that Viking had prepared. As usual, they gave a nod to the day's port by adding local specialties, like delicious Dutch cheeses, traditional brown bread and ontbijtkoek (a cake made with rye flour and spices like cloves, cinnamon, ginger and nutmeg). As excited as we were to see Amsterdam, we were glad to have enough time to savor a few of these delicacies before our scheduled departure. A taxi arrived promptly at 9:30 (how typically Dutch!) to take us to our hotel. We dropped off our bags at the front desk and got a tourist map and a one-day tram pass. The first place we headed was to the Rijksmuseum, a world-class museum that has the largest collection of Dutch art in the world. We saw paintings by famous artists such as van Ruysdael, Hals, Vermeer, Steen and Rembrandt. Not Van Gogh, though. Vincent has his own museum next door. We budgeted two hours for the museum. Thankfully, we didn’t lose any time on the ticket line because we had pre-purchased our tickets. We managed to hit the highlights without feeling too rushed. By the way, even if you don’t care to visit the Rijksmuseum for its art, its architecture makes the building still worth a visit. Tip: To avoid long lines at the Rijksmuseum, purchase a skip-the-line Rijksmuseum ticket online before you go. Arrive early to avoid the crowds; the museum gets busy after 11 am. As we left the museum, we stopped for a simple, lightweight souvenir: a photo with the IAmsterdam sculpture. It's the newest city landmark, and an ideal obligatory photo stop for many visitors, though I can't figure out how you could take a selfie. 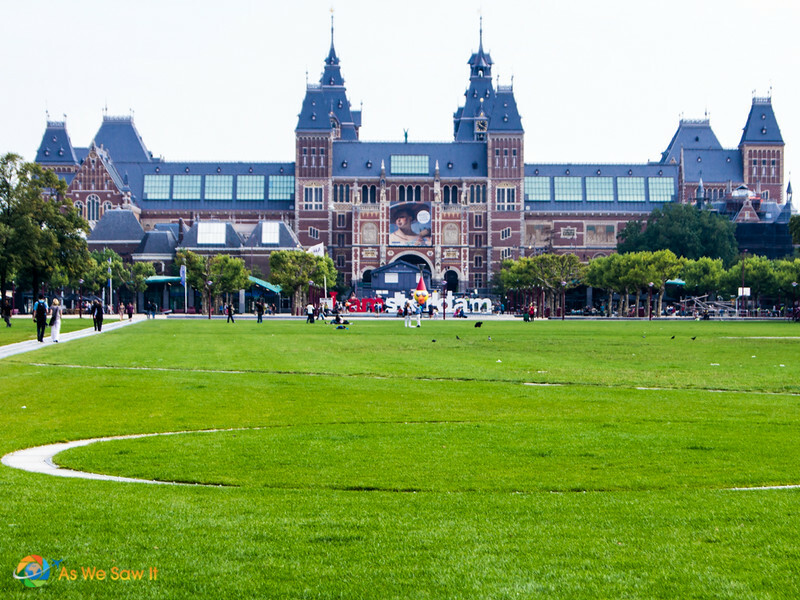 It is always on display on Museumplein, the public square bordering Rijksmuseum. Tip: To get a photo without the crowds, you must get there very early in the morning. By now it was lunchtime, so we headed to a lively, open-air square that is only a few blocks from the museums. Leidseplein is full of cafés, and we knew we’d find something to our liking. We didn’t expect to pass any Amsterdam attractions en route, but we did: the House of Bols. You may have heard of Bols liqueurs: They are the world’s oldest distilled spirit brand, making liqueurs in Amsterdam since 1575! Had we not been museum fans, this might have made a good alternative. Bols offer a fascinating, interactive tourist attraction called the Cocktail and Jenever Experience. Foodies that we are, it was tempting to go in. The tour ends at the Mirror Bar, where bartenders will mix any cocktail you create before your very eyes. You can also learn the art of flair bartending (think Tom Cruise in ‘Cocktail’) and shop in the Bols Shop. Waving goodbye to the missed opportunity, we continued walking. A few blocks further on, we found an enchanting, willow-lined canal … and the Hard Rock Café on the far side. 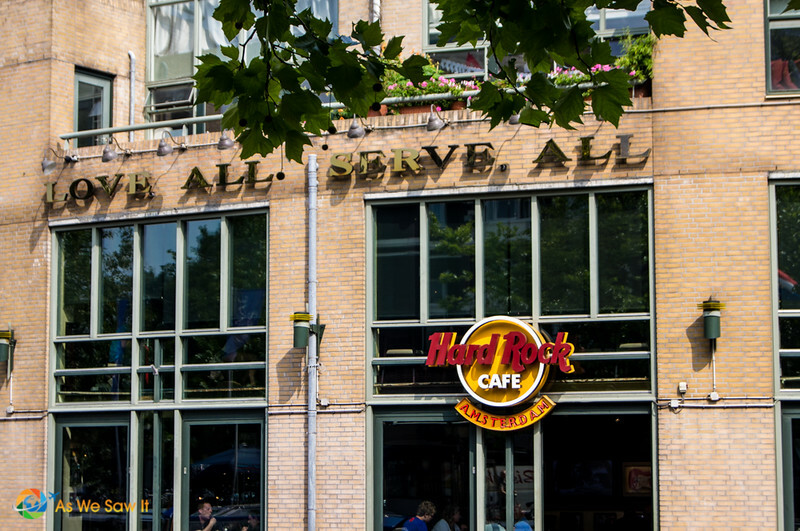 Souvenir time: Rather than add weight to our bags with dust-collecting mementos, we take photos of Hard Rock Cafes around the world. Maybe it's silly, but we think it's fun. We stood on the bridge for a few moments to enjoy the ambiance. Cruise boats puttered below us, showing their passengers the best of the city from water level. Knowing that a canal tour is one of the best things to do in Amsterdam, we stopped at a nearby kiosk and bought tickets for a 2:00 pm tour. Tip: When it comes to canal cruises, Amsterdam has a boatload of options, from hop-on-hop-off to dinner cruises to Amsterdam by night. Click here for examples. 4. Lunch at a brown cafe – with Indonesian food! Bruine (brown) cafés are to Amsterdam what pubs are to London. They are as much a part of the city's charm as its canals, architecture, and its other famous sights. Not far from We found At Leidseplein, we stopped for a bite at Café Reynders, a traditional Dutch brown café. 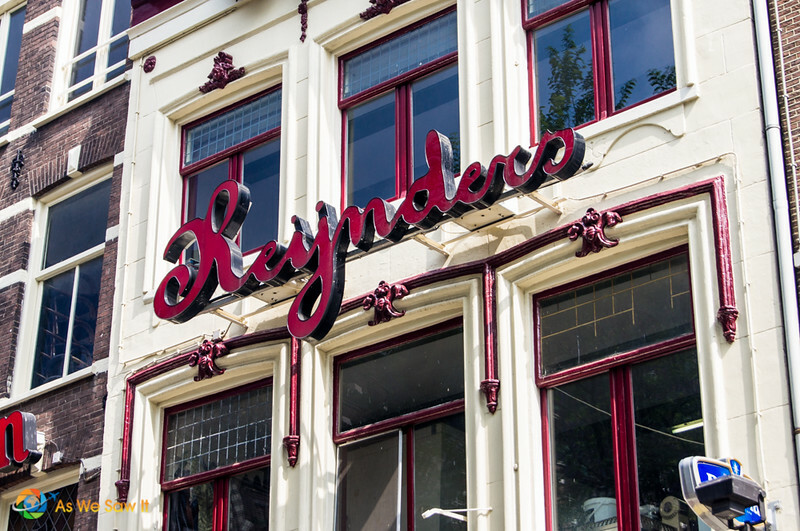 Founded in 1880, Reynders café hasn’t changed much from what it was back then. Inside you will even find pictures of how it looked on the Leidseplein almost 100 years ago. The weather was so pleasant that we asked to be seated at one of the tables on the square. We both ordered a beer, chicken satay skewers and frietjes, a.k.a. “chips” or “French fries”. Both Belgians and Dutch eat frietjes with mayonnaise, so of course we had to try it. Verdict: it’s a keeper. On a side note, Dutch mayo tastes different than what we have in the U.S. 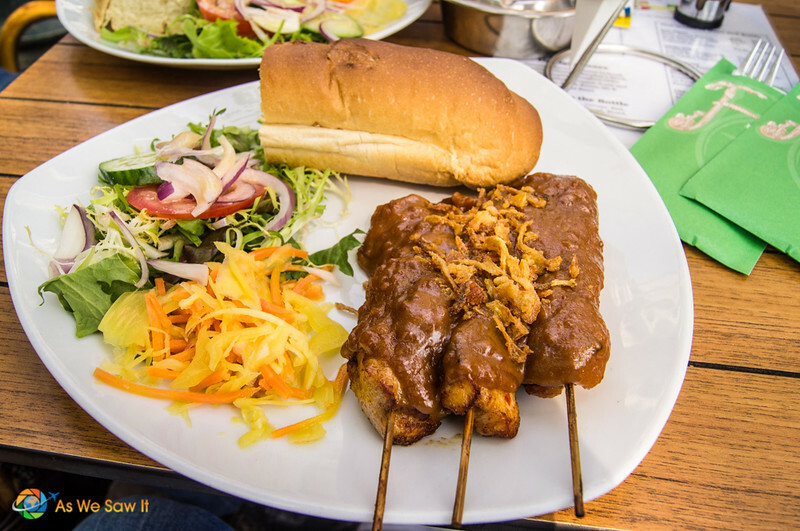 Although it hails from Malaysia and Indonesia, chicken satay is a favorite in the Netherlands. There's a good reason for this: Dutch East India Company once reigned supreme in much of Southeast Asia and the traders brought many of Asia's delicious recipes back to their homeland. 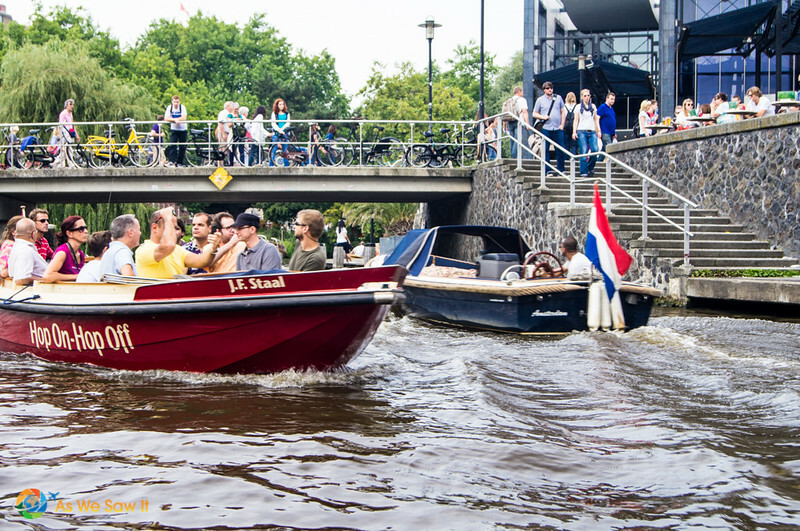 Amsterdam is full of canals, which is why a canal cruise is an ideal way to see the city: Wealthy merchants dug more than one hundred kilometers of them in the 17th century during Holland's prosperous period (aka the Dutch Golden Age). Besides, the Amsterdam Canals are a UNESCO world heritage site. Distinctive houseboats and narrow, side-by-side homes line the picturesque canals wherever you look. The stairs in these buildings are so narrow they need to use hooks on the gables to hoist goods from the waterways to upper floors. If we were to advise just one thing that you absolutely must do, it would be to take a canal cruise in Amsterdam! No matter how much exploring you do on foot, you'll get a completely different perspective of the city from a boat. Besides, this one-day Amsterdam itinerary requires a lot of walking, and this is a perfect way to save your feet. Tip: There are two types of tours: Choose between a hop-on hop-off boat or a regular tour that brings you back to where you started. Check various tourist brochures for available discount coupons, or see a list of cruise options here. Once back on land, we headed to our next destination via The Nine Streets (De Negen Straatjes). These old cobbled streets run between Herengracht, Prinsengracht, and Keizersgracht, three canals which Farieda told us shouldn’t be missed. Photographers like Dan will think they were in heaven. The canals are surrounded by some of the most beautiful traditional Dutch houses in Amsterdam. The Nine Streets border the enchanting Jordaan neighborhood, which was our next destination. If you want a sense of authentic residential Amsterdam. Jordaan is full of classic 17th and 18th-century buildings with cozy courtyard gardens, and narrow streets sprinkled with local shops, quaint bars and brown cafés. The Jordaan is also home to two of Amsterdam's landmarks, both of which we wanted to see: Anne Frank House and the 400-year-old Dutch Protestant church, Westerkerk. Anne Frank's house was on Dan’s bucket list. During World War II, Anne Frank, her family and four other people hid from Nazi persecution in secret rooms at the rear of the 17th-century canal house. Their hiding place came to be known as the Secret Annex. Anne Frank did not survive the war but she became known in 1947, when her wartime diary was published. We booked online ahead of time and paid extra for an informative orientation that covered the life and times of the Frank family. The questions folks asked afterward were most enlightening. Next, we were escorted next door into the building where the Frank family had hidden for two years during the war. Everyone was asked not to talk during the visit so as not to disturb other visitors. The lower floors display photos, exhibits and videos about Anne, her family, the war and the Holocaust. The curators have also mounted informational writings on the walls and videos play here and there along the way. The top floors are the actual rooms where the family stayed, furnished with items similar to what they had. Tip: To avoid long lines and the risk of not getting in, reserve online ahead of time. if you’re willing to pay a little extra for the 30-minute advance lecture portion, it’s worth it. By this time, our feet were hurting from all the walking, so we hopped on a tram. On the way, we passed the only floating flower market in the world, Bloemenmarkt. This unique market, with flower stalls on houseboats, has been here since 1862. 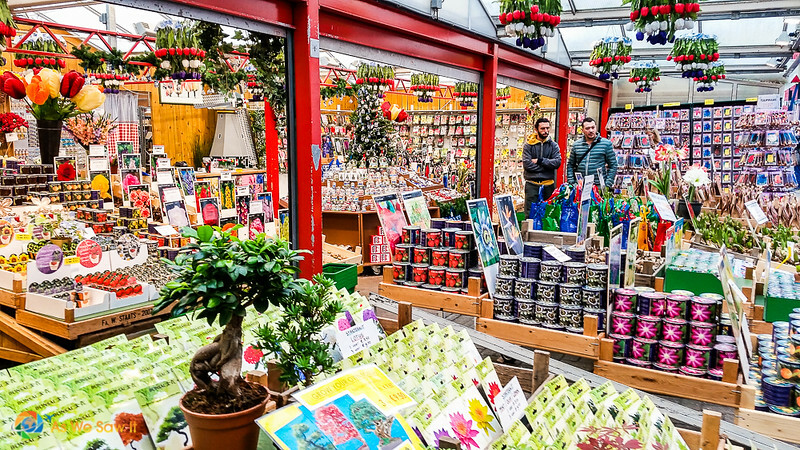 You can buy flower bulbs, all kinds of souvenirs, or just walk around and take colorful pictures. We saved this for our next trip, but if you have want to stretch your one day in Amsterdam into two, this is one of the best attractions in Amsterdam. 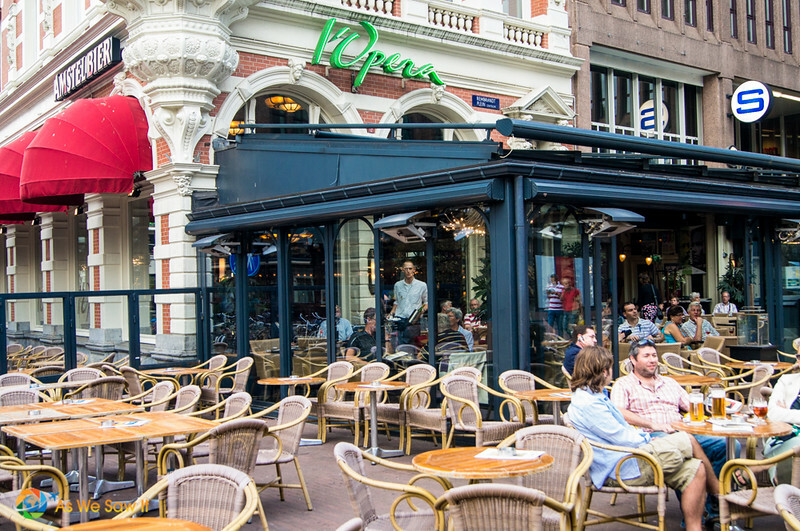 We alit at Rembrandtplein, where Farieda had recommended that we eat at Café l'Opera. She even told us what we should order: Bittergarnituur. This is a plate of Dutch appetizers, including bitterballen and kroketten. No regrets for following her advice. A Dutch beer on tap washed it all down. Usually served with mustard, bitterballen are meatball-sized balls of potato and ground beef that are breaded and fried. Kroketten are similar, but in an oblong/football shape. They were both delicious and the restaurant's prices were fair. These appetizers were so filling that we never bothered with an official “dinner.” Fine with us, more time to explore Amsterdam! Tip: Learn how to make bitterballen and kroketten and you’ll be able to use up leftovers as Dutch housewives traditionally do. 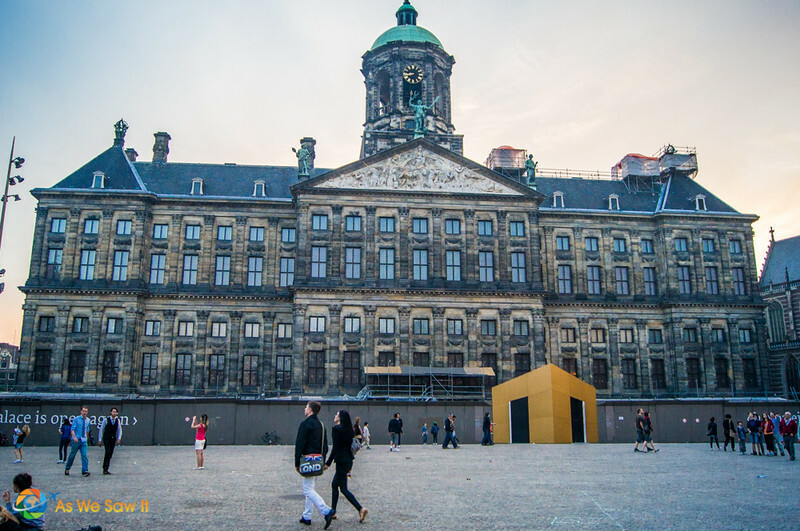 Our next destination (via tram) was Dam Square, Amsterdam’s central square, where the Royal Palace is located. This is one of the most well-known locations in Amsterdam. It was too late to tour the Royal Palace but we could still photograph the National Monument and Nieuwe Kerk (New Church). Tip: Shoppers should make it a point to visit De Bijenkorf (“The Beehive”), Amsterdam's premiere department store. 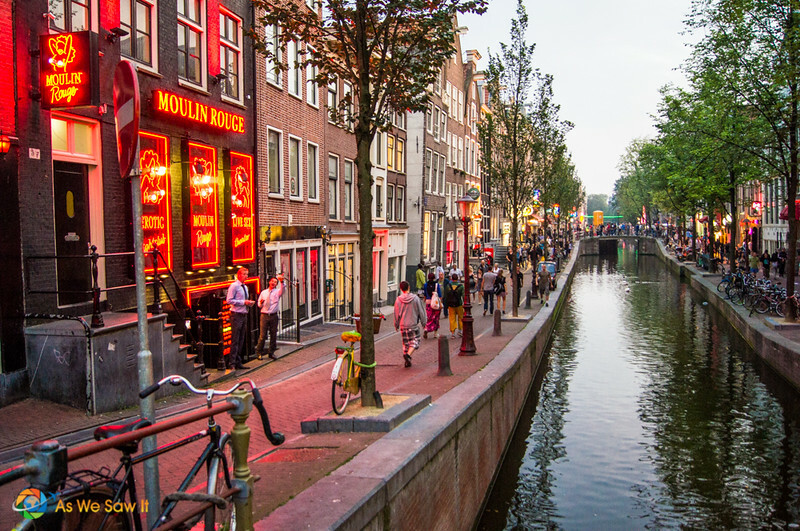 With its in-your-face prostitution and coffee shops, Amsterdam’s infamous Red Light District is one of the world's most renowned tourist attractions. This is window shopping on a completely different level, where scantily clad women (and some men!) display their attributes, standing in windows illuminated by the fluorescent red lights overhead. Whatever adult pleasure you might desire, it’s available here. You can easily visit during the day, but if you want to see the true side of the Red Light District, you’ll need to visit after dark, when it really comes alive. Amsterdam is generally safe, but if you don’t feel comfortable walking around at night on your own, you can always join a guided tour like this one. Or, if you have walked off the appetizers you had at l’Opera, you can opt for an even more creative experience with this Private Red Light District and food tour. As intriguing as the “window shopping” might be, the Red Light District has more to offer than that. Raise your eyes above the windows while you’re walking arounl. This is a beautiful area in its own right, full of 300-year-old gabled buildings and other expensive, photo-worthy real estate. Tip: Be careful with your camera as you walk because one of the girls might think you’re taking a photo of her. That’s a strict no-no. Amsterdam’s nighttime splendor isn’t limited to the neon lights in the Red Light District or at the Amsterdam nightlife spots. The city’s houses and bridges are beautifully lit after dark. Use your remaining energy to enjoy a canal cruise or stroll across Amsterdam’s many bridges on your way back to your hotel. It’s a magical way to end your day in Amsterdam. If you think one day in Amsterdam won't be enough, the city offers a variety of lodging options, everything from hostels to hotels to staying in a local home. (Check HotelsCombined for all your choices.) 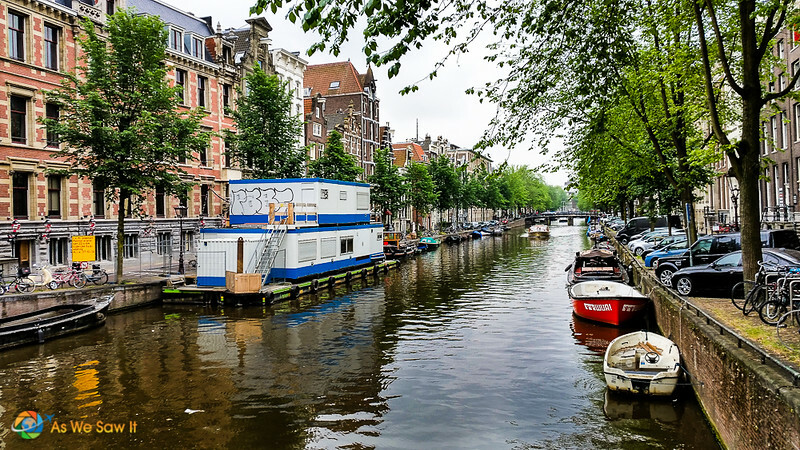 You can even sleep in a houseboat on a canal if you want. How fun does THAT sound?! We have stayed at both the Bilderberg Garden Hotel (in a residential area of Amsterdam) and at the more central Hotel Renaissance Amsterdam mere blocks from Centraal train station). We were pleased with both, and both were conveniently near a tram stop. We’re glad you like the post; it’s a reader favorite. Please come back to our story after your trip and let us all know which activities you enjoyed the most. I think this is the best Itinerary I found for Amsterdam. It had lots of information and helpful. May I know what all the canal cruise covers? We’re so glad our article was helpful. 🙂 To answer your question, the canal cruise we took (here’s the link) was a basic 1.25-hour narrated cruise through Amsterdam’s canals. We were on an enclosed boat. No food, no stops. If you’d prefer something else, here’s the link to over 100 canal cruises you can choose from. Do let us know if you have any other questions. If not, enjoy your trip! We completely agree, Kanika. It’s one of our favorite European cities, too. We asre doing a father and son boding trip to AMS this Saturday. Any reasonable place we can stay overnight? We arrived on 7 October at 9am, then leave following day 10.30. We really want to follow your blog re 1 Day Amsterdan tour. We’d love to give you a good lead, Bennett, but lodging prices vary a lot and people’s tastes vary, so it’s hard to know what to recommend. We would certainly recommend both of the hotels we’ve stayed at (Bilderberg and Renaissance). If they don’t fit into your budget, you can’t go wrong with the hotels on Booking, because they also have real reviews from people who have stayed there themselves. I would not like to advise against visiting Amsterdam, but I would like to reccommend tourists to visit other Dutch cities as well. Amsterdam has become very touristy. It has lost a lot of it’s authenticity and has earned the nickname ‘amusement park Amsterdam’ in the Netherlands. You will not really experience the Netherlands if you just stick to this one city. Please give nearby cities like Leiden, The Hague or Haarlem a chance. Or visit the south (Den Bosch, Maastricht) or north (Zwolle, Leeuwarden) of the country. Absolutely true – the rest of Amsterdam has so much to offer! We always advise people who want to visit America to take the time to get out of cities. To say you’ve seen the Netherlands because you’ve been to Amsterdam is like saying you’ve seen America because you’ve been to New York. There will always be more to see than a vacationer has time for. Our hope is that people will use our “one-day itineraries” as a way to see the highlights quickly;, then use the rest of their time to get out of town, meet the people and experience the culture. Amazing photos and information. Planning to head there soon and the article has come quite handy, thanks. Thanks, David. We’re glad it was helpful. The Top 10 Travel team are heading to Amsterdam in September and cannot wait. It has been 18 years since I was last there and it will be great to show the kids the fantastic history and sites of the city. Have a great time, Richard! We hope you’ll spend more than one day there, because Amsterdam has so much to offer. As said, Amsterdam is the best city to live. The images were so attractive, planning to go for a trip to Amsterdam. Good post, very useful. Thank you for this note. I am going there with my family on this June. On the 1st day, we’ll be arriving around 2PM. The next day, will be a full day cruise in Amsterdam. On the 3rd day, we will be heading to Rotterdam. I want to make full use on my arrival day and 2nd day (full day). This list helps a lot. Any Idea how to combine and add more destination? You are more than welcome. I’m glad our experiences were so helpful. Not knowing your interests or who you’re traveling with, it’s hard to know what to recommend, especially if you only have half of the first day to explore. If you’re on a full day cruise in Amsterdam on Day 2, you will see most of the city from the water. So on Day 1, I would suggest you stick to land based activities. If you’d like other options, you can check Get Your Guide’s Amsterdam tours page. Be aware though: We like to recommend them because of the variety of tours and because you can see ratings and reviews from previous tourists. Besides, the ones we’ve booked ourselves have been excellent. They have literally hundreds to choose from in Amsterdam. For what it’s worth, Get Your Guide’s much smaller list of Rotterdam tours can be found here. Great information and very informative! All of your info will be helpful. I have pinned them all! My husband and I have a June, 2019 trip planned with Viking, Grand European Tour. Trying to decide if we should add extra days at Budapest or Amsterdam. Our tour begins in Budapest. Any suggestions would be appreciated. Just one question. How did you pack your clothes in a backpack and carry-on? I would love some help with packing. Thanks so very much. So glad I found your site! Ooh, lucky you! We’re sure you will have a wonderful time. We’ll have to answer your question in general because you didn’t mention how many extra days you can add to your trip. To begin with, if you can manage it, we’d suggest staying at least 2 extra nights in both cities. There’s so much to see, eat, and do … and who knows when (or if) you’ll have another opportunity to visit? Viking’s Budapest-Amsterdam itinerary begins with an overnight in Budapest, but we suggest that you arrive in Budapest at least one day before departure. Travel delays happen; that adds a buffer to ensure that you won’t miss any of the tour. We arrived 2 days beforehand, which gave us time to explore on our own, eat in town, and spend an afternoon at Gellert Baths. (Couples massage there was fun and cheap, we thought.) We kind of wished we had planned more time there, to be honest. As to Amsterdam, you’re on your own. The ship docks only hours before the cruise ends, and no tours are included. If you want to see Amsterdam at all, you’ll have to do it on your own. We’d suggest you use our whirlwind itinerary and spread it out over a few days, if you can manage it. Two to three nights will give you time to enjoy the city and see more than we have shared here. I plan to share other Amsterdam tour ideas in a future article. Dress code is casual, so leave heels and gowns at home. A skirt will be helpful for the concert in Vienna. I brought a pair of black ballet-style flats to go with my skirt. Bring an extra pair of walking shoes; your feet will appreciate the change. Plan your wardrobe around one neutral color. Black shoes, bag, hat, belt, pants, socks, skirt, sweater for instance. Add color in scarves, necklaces, and shirts. My cheap scarf (bought at H&M) was multi-colored and went with everything. Remember a hat for the sun, and bring a sweater because evenings can be cool. Don’t be afraid hand-wash clothes in the sink and/or shower. Viking is generous with toiletries; we used the shampoo and body wash as detergents. All the cabins have a retractable clothesline in the shower, and as for wrinkles, you will have an iron and plenty of hangers. Counting what I wore on board, I brought 6 short-sleeve shirts, a skirt, 4 pants, 2 walking shoes (walking sandals and Skechers), 8 undies, 2 bras, 4 pairs of socks, 1 belt, 1 scarf, 1 sweater, and a pair of ballet flats. I wore gold earrings, a necklace, my Fitbit, wedding ring, and didn’t bring any other jewelry. We have become packing cube converts, lol. So many of our friends swore by them that we broke down and bought them to try ourselves. Who knew that something so simple would be so useful? They really keep everything organized, and make packing/unpacking a breeze. We keep our dirty clothes in one, too. If you’d like to check them out, we like these the best out of the 4 brands we’ve tried. They hold up the best. Any other questions? Let us know, we’re happy to help! Some great tips – I was supposed to visit Amsterdam on a cruise last year but we couldn’t get into port due to a storm – I’m hoping to visit some time this year though! Wow, that’s disappointing. If you get to visit this year, we would like to hear if you find our article helpful. Wow that’s a lot in a day. But we know how many of the north Americans and cruise people like to take the most of the opportunity when they are here. Your article still stands relevant all these years later. You’re right, Michael, it’s a lot. Spreading it out over a longer time period is a much better idea, but hey, we did what we could in the time we had. Is there anything you would change? We hope you have a wonderful time, Annika. 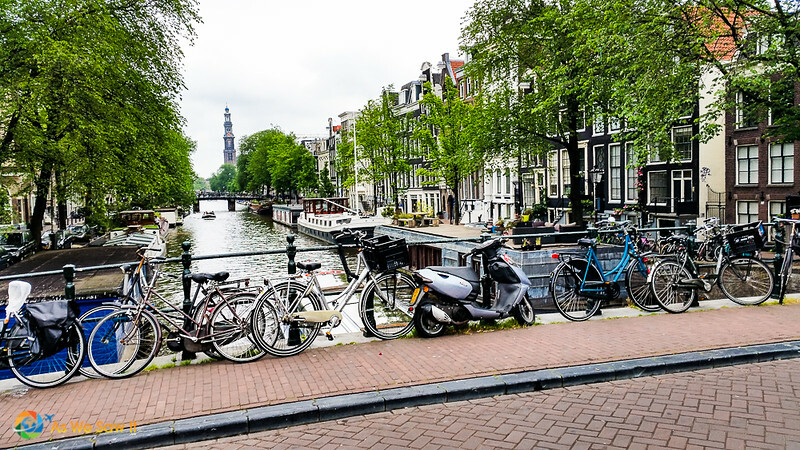 There are so many great things to do in Amsterdam and it was hard to prioritize. I think we’ve distilled the best into our day, though to be honest it’s a whirlwind tour. Some folks have spread the itinerary into two or more days, and that’s a brilliant idea. Wow! Really loved reading this post all the way down! Indeed a great post seeing Amsterdam in one day! Amsterdam is such a beautiful place, so much thing to do and to enjoy here. I love all of your photos, captured places in Amsterdam beautifully Thanks again for sharing this outstanding post! You’re welcome, Evan. I’m glad you found our article useful. Renting the bicycle isn’t the problem. The issue is that newcomers rely on maps to navigate, and it’s unsafe to take your eyes off the road. You’re right that Amsterdam is easy to get around. It’s also hard to leave, because the city is so enjoyable and the people are so friendly! I must confess that although I have vague memories, my time in Amsterdam is so far behind me now that it takes posts like this to bring it back. While beautiful, I’ll never forget a 7ft Russian man built like an outhouse door walking along the street and collapsing into some tables. I helped him up and he told me, I quote “Cookies! Too strong”. It was a great little city and I plan to go back when I head back to Europe this year. Thanks for reminding me! You’re welcome, Gav. We enjoy re-reading our stories and spending a bit of time browsing our travel photo gallery. Like you said, they can refresh long-forgotten memories. We’ve been back a few times since and STILL feel the same way about the bikes! Maybe next time we’ll venture out on two wheels, who knows? Amsterdam is famous for its canals, beautiful houses, coffee shops but I found it more that that. It is an awesom places to visit. We agree, Suzan. It is awesome. What else did you like about it? Great post! I agree, you do need to wear good shoes if you want to do this 😉 But it’s worth it right? (I might be biased as a Dutchie 😉 ). Goodness, yes, Amsterdam is VERY worth it! We just returned from another visit and spent a day with a Dutch friend. Might have to do a “One Day in Amsterdam – Part 2” post for those who have “been there, done that.” What a great city. Linda thank for your reply. Ok I will try. Hi Crystal, I really hate to disappoint you but we didn’t take a tour and don’t know anyone who has done one. If it helps, though, if you Google “Amsterdam bike tour” you’ll find quite a few one-day tours of Amsterdam and some of them are reviewed on TripAdvisor. Spending one night in Amsterdam will give you a lot more time to sightsee, but if you intend to take the Paris-Amsterdam train in the morning and return at 7 pm, I would advise you to take the high speed Thalys train – which requires a prior reservation – and be prepared for a very long day. If you only have enough energy for a few things, then my top picks would be the Rijksmuseum (#1), eat some Dutch food (#3), take a Canal cruise (#4), visit Anne Frank House (#6), go to Dam Square (#8) and see the Red Light District (#9). I hope you enjoy your visit. Amsterdam is such a wonderful city. Thanks so much for this! I will be in Amsterdam for 2 days and have been trying to find an awesome “one day tour” of the must see’s so that day two can be spent looking at arb places not on the big tourist sites. Can’t wait to go! I hope you have a blast! Let us know about your trip, we’d love to know if this post was helpful. Hi Linda Great post!! So nice to see as a Dutchgirl how compleet you blogged this all, and liked it here! Still there is sò much more to see in The Netherlands beside Amsterdam. Really you should next times try also some diffrent areas too!! There are also more airports region ones,and as you problebly know for American understandings the distances are not so far anyway:)) Loved to read your blog! Thanks for sharing!! Dankuwel, I really appreciate all the nice things you said. 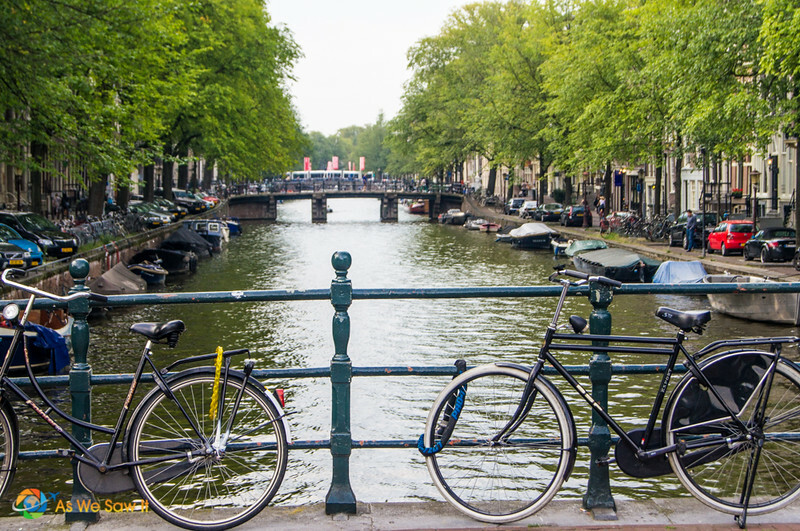 We agree that there’s a lot more to see than just Amsterdam. That’s like saying you’ve seen America because you’ve been to New York City! We had the chance to visit Kinderdijk and see the windmills but I’ve not had the chance to write about it yet. We actually had planned to visit Rotterdam and drive to Maastricht in May. Unfortunately we had to cancel because of family issues, but we hope to have another chance to visit in, the future. We love the Netherlands. You guys packed in quite a bit in a day; congraats! I tend to start at Centraal Station and work my way down through the city. You missed having fries at Mannequin Pis and the Heineken Beer Museum, but there is only so many hours in a day. Thanks, Kerwin, our feet were pretty tired by the end of it, but the day was worth it. Thanks too for the tip; I’d never heard of Manneken Pis restaurant until now, and will makea mental note to have their fries next time we’re in Amsterdam. AND the Heineken Beer Museum, along with the House of Bols, which I’m told is quite the experience. Wow! You did a great job for only having one day in Amsterdam. I can’t wait to go myself! I’m a huge fan of Vincent Van Gogh, so I’d love to check out his home town! One of the reasons why I love the Netherlands is the food, it feels like home 🙂 Indonesian cuisine is very popular and it’s so easy to find them unlike in other parts of Europe 🙂 Great post! I have to revisit Amsterdam someday! Funny you mention that. Next week we have a long layover in Amsterdam. We plan to escape the airport and meet some friends for lunch at an Indonesian restaurant. Maybe I can practice my language skills: “tidak pedas, silahkan.” You Indonesians like it really spicy. Me, not a fan. Thanks Marysia. Can you recommend any other places to visit? grat post Linda, where was that few years ago when I had 11 hours layover in Amesterdam 🙂 summarized and to the point. Good post! I’m headed to Amsterdam and will have just one day there as well. You and Dan really covered a lot in your short time there! Thanks so much. What do you plan to do during your one day there? If you want to see as much as we saw, we recommend very comfy shoes! Hi Wanda, Amsterdam’s port is large so walking distances completely depend on where your ship gets docked, and they don’t have a regular dock. They say trams are a 10-minute walk but I guess a lot depends on what kind of shape you’re in (we know a sweet couple in their 80s who still ski!). We took a taxi from the ship to our hotel (to drop off our luggage) and it was expensive, so I don’t recommend that. The trams are easy to get on and off of and the central city itself is rather compact. If you pull out a map you’ll see that we covered a lot of Amsterdam’s area in one day. Besides the price difference, it all depends on which you prefer. I can see the value of taking a private city tour – you can get more details and ask more questions – but we’re basically do-it-yourselfers and are happy enough with just new scenery, languages and food. If you’re adventurous, you can enjoy Amsterdam on your own, especially because most people speak English. On the other hand, if you don’t have a lot of stamina or mobility issues, the private tour might be easier. Either way, just don’t miss the canal tour!